Report author Michael D'Aulerio with Lohtse 200 Race Directors and his 200 Mile buckle. Running 50 miles will change your life and running 100 miles will rewire your brain. But what happens when you run farther? What happens when you run twice as far as the 100-mile distance? When you run 200 miles it will not only reshape your mind…it will bend your reality. And that’s just what the Lhotse 200 mile ultramarathon did. It blasted away any sense of limitations I had left in my running as it morphed common forms of measurement like ‘time’ and ‘distance’ into an abstract illusion. Because when you master running in the present moment, do any such concepts exist? You see, the Lhotse 200 mile ultramarathon did not start Labor Day weekend. For me, it started months before. The preparation was extensive, and that goes for both body and mind. Every small piece of the 200-mile training puzzle contributed to the big picture of race day. The big picture of running a direct route straight through the impossible and right on the other side of insanity. After training was complete, it was time to hit the road. As I headed west to Oklahoma to run America’s fastest 200-mile ultramarathon, I became certain of one thing. I was sure I wouldn’t give up, no matter what sacrifices I had to make. The park where the race took place held a certain degree of beauty. There was an apparent yet unspoken connection between the runners and the nature contained within the limits of the park. The course consisted of a curvy 1.1445-mile loop on hard cement. The 200-mile racers ran around the loop 175 times. When the gun went off, we began running. I kept my pace slow and steady with the mantra “slow is fast.” After 24 hours of running, I was feeling good. Well, as good as you can feel after running 100 miles. Everything was going well; however, this was an ultramarathon…right? As ultrarunners we know it’s not about how you perform when everything goes right, it’s about how you perform when everything goes wrong. Sooner or later my steady pace broke, and I began dealing with a problem I never faced before. Well, at least not in such severity. 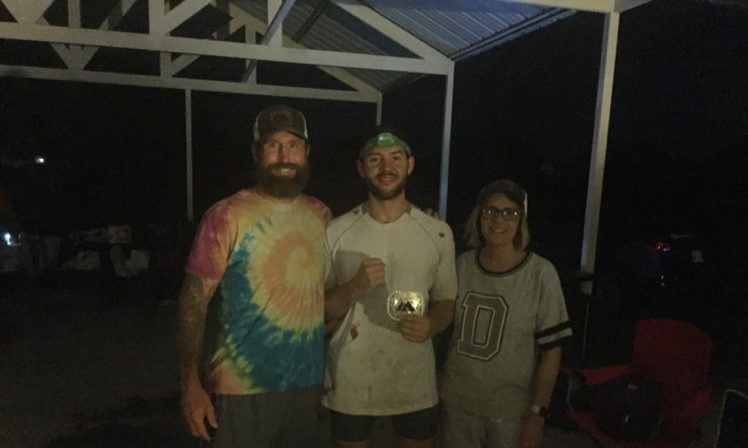 So, what went wrong during my first 200-mile ultramarathon? It wasn’t the nausea that I quickly cured with a reduction of sugar and it wasn’t the chafing that stopped from my signature baby powder+diaper rash cream combination. These issues were expected, and from experience, I knew how to manage them effectively. No, the biggest problem I faced was blistering. Severe blistering caused mainly from spilling a cooler of water on myself. I developed two huge blisters on the bottom of my feet that made every step a painful step for the better half of the second day. It slowed me down by a lot, and I mean a WHOLE LOT. As I reached a sloth-like pace, I began to wonder if I could continue through such a tortuous experience. But after some blister maintenance and a solid stretch of downtime, I tied my shoes back up to run. There were many miles to go. It was going to be a tough day to the 200-mile finish. But even with the severe blistering, I had faith, and that incremental speck of faith is what propelled me to move forward. I knew God was with me, and that’s all I needed to get moving. That’s all I ever needed. As I started running again, my blisters were now manageable. It was one step at a time, but the farther I ran the more confident in finishing I became. Once I had the blisters under control, it was smooth sailing to the finish…right? Far from it. The intense sun exposure caught up with me and my body began to overheat. I started slowing down again at a time when slowing down was costly. Fortunately, here is when I was struck by a sudden wave of ultra running inspiration. Out of nowhere a film clip from an old Badwater documentary popped into my head. It was a clip of a runner whose crew used a giant water-spraying machine to keep him cool. Although there wasn’t a random shed of landscaping equipment that just so happened to sit alongside the course, I did manage to get my hands on a small spray bottle. Who would have thought a spray bottle filled with cold water would have such a positive impact? I used that bottle for the rest of the race, spraying my face and mouth to stay cool. Things were going well again, and I began finding my groove for the first time in a long time. But here is when the next obstacle arrived. At one point to cool down, I stuck my head into a cooler filled with ice water. It felt refreshing, but the instant I rose up, blood began pouring from my nose! Nosebleeds became a constant problem for the remainder of the night. I couldn’t touch my nose without causing it to bleed nor could I blow it. Even when gnats flew inside of it, they had to stay there as it was that or risk another enormous nosebleed. As I ran with my shirt rolled up and pressed against my nose, I spit misty clouds of blood into the air illuminated by the bright light of my headlamp. But I kept moving forward regardless of the blood, regardless of the blisters, and regardless of the heat. As I like to say: the moment when your legs give up is the exact moment when your heart gives more. It was one foot in front of the other, and one way or another, I crossed the finish line! The Lhotse 200 was a race filled with many ups and down, but no matter what happened I kept my forward motion RELENTLESS. When you run 200 miles, the highs can take you to outer space, but the lows can put you in a race day grave. I knew self doubt would arise going into the race. But even when times were tough, I never gave up faith in my abilities to finish. After the race when I reached my hotel bed, my legs hurt badly. It was only a few hours until my flight back home, and I needed some sleep. So, I went into the hotel room bathroom, laid on floor, wrapped my upper body in a blanket, and stuck my lower body on the floor of the shower. With a steady flow of ice cold water falling on my legs, I was able to get a few hours of shut-eye before a painful journey back home. It took three people asking me about my race in the security line of the airport before I realized the back of my race shirt read “Ask me how far I ran on Labor Day weekend 2018?” I was caught off guard one last time by a race full of surprises. Eventually, I made it on the plane, sat down, looked out the window and smiled…I ran 200 miles! It was time to go back home and be a dad. Now…um…who has some Advil? !